(SCMP) Police manhandle HK journalists. By Celine Sun. June 26, 2008. Hong Kong reporters were pushed, jostled and manhandled by mainland police in Beijing yesterday when they tried to cover chaotic scenes as tens of thousands of fans fought to grab the last batch of Olympic tickets. Scuffles broke out yesterday morning between several Hong Kong journalists and mainland police officers who were trying to shoo reporters and photographers back to official media zones. Cable TV reporter Vicky Law Fai-cheung was pushed to the ground and had his neck shoved by one officer, while a video camera carried by a Television Broadcasts Ltd cameraman was damaged by police. Law later sought hospital treatment for a sore throat. Other photographers and video cameramen were forcibly dragged by police from stools they were using to shoot pictures at the scene. Post photographer Felix Wong was detained at about 10.30am after a scuffle with police. Xinhua quoted the Beijing Municipal Information Office as saying Wong disobeyed police orders, broke through temporary barricades and kicked an officer in the groin. Wong said after he was released at about 4.30pm that events had been "totally chaotic". "I saw an officer who was dragging a cameraman down. As I was trying to take a picture of the officer, I had unintentional body contact with the officer. I feel sorry for what happened," he said. He said he was treated well in detention and went to visit the injured officer after being released. A spokeswoman for Hong Kong Cable TV said it was unacceptable for mainland authorities to treat the media that way. "We hope the authorities will live up to their earlier promise to allow full freedom of the press during the Olympic Games," she said. A TVB spokeswoman said the company had complained to the Beijing International Media Centre and had urged the authorities to investigate the incident thoroughly and pay compensation for damage to equipment. The Hong Kong Journalists Association said it was shocked by the violent interference with Hong Kong journalists' reporting activities. It was concerned that as the Olympics approached, Beijing had taken more frequent and serious steps to restrict the freedom to report. It called on the central government to give clear instructions to the Ministry of Public Security not to interfere unduly with the work of journalists. The Hong Kong News Executives' Association "strongly condemned" the violent police action. "Our association is very angry about the incident, which will seriously undermine the country's image. It has obstructed press freedom, broken the promise China made when applying to host the Olympics and tainted our country's image," it said. The association urged relevant authorities to investigate. "It must be made sure that journalists will not encounter harassment and interference during the Olympic Games," it said. (SCMP) The Post response to the incident involving photographer. July 26, 2008. "Felix was detained this morning after being involved in a scuffle between Beijing policemen and members of the Hong Kong media while covering the sale of Olympic tickets. He was released this afternoon after paying a visit to the police officer he inadvertently hurt during the scuffle, to express his regret. He has undertaken to assist the authorities with investigations into the incident. "It is most unfortunate that scuffles broke out between members of the Hong Kong media and Beijing policemen responsible for maintaining order at the points of sale. We believe Felix was just trying to do his job as a photojournalist. "Both journalists and policemen, as well as the tens of thousands of Beijingers who queued up for the tickets, were victims of the relevant authorities' failure to make proper arrangements for the orderly sale of tickets." (China Daily) Released HK reporter apologizes to injured officer. July 25, 2008. A reporter with a Hong Kong-based newspaper apologized on Friday afternoon to a Beijing policeman who he had injured after a scuffle at an Olympic Games ticket outlet. Felix Wong, a South China Morning Post (SCMP) newspaper photographer, was released after he was taken away by police in the morning. 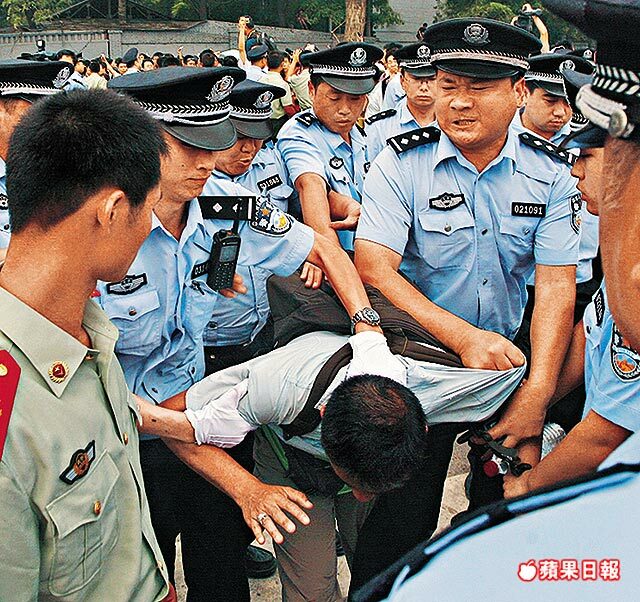 He was escorted away from the scene after breaking through a barricade set up to control a crowd lined up to buy tickets and kicking a policeman in the groin, a Beijing municipal government information office spokesman said. More than 30,000 people queued for the final chance to buy Olympic tickets near the National Stadium, aka the "Bird's Nest," at about 10:30 a.m. when the incident happened, the spokesman said. "Police immediately informed the SCMP's Beijing bureau about the incident," he said. "At about 4 p.m., a bureau director and Felix Wong went to the hospital to visit the injured officer, Zhang Yuzhu." "Wong made a sincere apology to Zhang and presented flowers," the spokesman said. "Wong has returned to his newspaper bureau. The bureau said it would cooperate with the investigation at any time," he added. The fourth and final phase of Olympic ticket sales to the domestic public began on Friday morning with 820,000 tickets on offer. The Games ticketing center said only tickets for competitions taking place locally would be available for purchase. That meant Beijing citizens could only buy 250,000 tickets for competitions in the capital area. The information office spokesman said the weather had been very hot and some people at the ticket outlet near the "Bird's Nest" became impatient because they had been waiting a long time. Police were brought in to cordon off areas to keep order and prevent incidents like stampedes. But the SCMP reporter did not obey police orders and broke through a temporary barricade to take photos, he said. "When police officers asked him to leave the temporary restricted zone, Wong didn't listen. He kicked a police officer in the groin and injured him," he said. "Wong was then taken away by police for investigation, and the injured officer was sent to a nearby hospital." During the investigation, Wong acknowledged he had not listened to police and had kicked the officer, the spokesman said. "Zhang suffered groin injuries and needs further observation in hospital," he said. (FT.com) Press and police in Beijing ticket clash. By Mure Dickie and Justine Lau. July 25, 2008. China’s attempts to avoid public relations embarrassment ahead of the Olympics suffered a blow on Friday as police were filmed manhandling journalists, in spite of repeated government promises to allow free reporting on next month’s games. Video from Hong Kong television stations showed Beijing police officers throwing one journalist to the ground. Police also apparently pulled cameramen from ladders as they tried to record chaotic scenes of people queueing to buy Olympic tickets. Hong Kong’s journalists’ association accused the Beijing police of “wanton violation” of press freedoms. Beijing Olympic organising committee spokesman Sun Weide said: “We have been trying our best to help reporters to cover the Beijing Olympics”. Cable News, a Hong Kong TV network, denounced as “unacceptable” the treatment of a reporter pushed to the ground by police who were trying to force journalists to leave an area near rowdy crowds of would-be-ticket buyers. A photojournalist from the South China Morning Post, a Hong Kong newspaper, was detained for six hours. The official Xinhua news agency said he was held for “breaking through a barricade set up to control a ticket-buying crowd and kicking a policeman in the groin”. Yesterday, the Hong Kong media organizations which had their reporters interfered by the police included NOW TV News, Cable TV News, TVB and South China Morning Post. The Beijing authorities decided to commence Olympic ticket sales earlier than announced, and the crowd surged upward in confusion. When the reporters tried to take photos, the police took action to prevent them from doing so and used force to chase them away. The police began with a NOW TV News camera person standing on a portable stool by pulling him down. A South China Morning Post photojournalists was also chased off. At the same moment, a Cable TV News cameraman was also being ordered off. 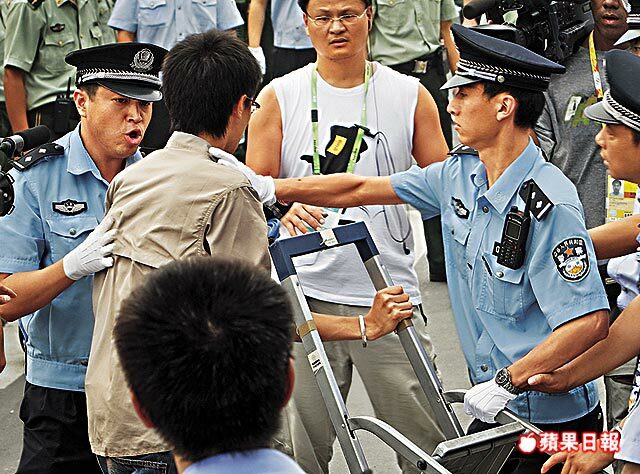 The reporter Vicky Law Fai-cheung went up to reason with the police, but one of them put a hand around his neck. Then another police man put an armhold around the neck from behind and pulled Law into the ground. Law got up and demanded to record the serial number of the police officer, who declined to cooperate. Another policeman then applied a hold on Law's neck again. Law felt uncomfortable around his neck. "A policeman put his arm around my neck and pushed me to the ground. There was some physical contact. I got up immediately and I wanted to copy down his serial number. But he was gone by then and the other policemen said that they did not see anyone attacking me." The video showed clearly that the police assaulted him, but the policemen at the scene all said that they saw nothing. They even denied chasing the reporters away from the scene. Law said angrily: "It is recorded on film, so it only goes to show that they are protecting their own." Afterwards, Law felt uncomfortable to even swallow saliva. He went to the hospital and found out that his vocal chord is swollen. 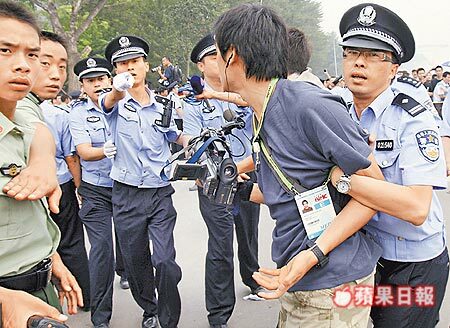 SCMP news photographer Felix Wong had physical contact with a police officer during the chaos. The police officer claimed to suffer a groin injury. Felix Wong was taken away and detained for almost six hours. SCMP issued a statement last evening to say that its reporter made unintentional contact with a police officer and offered apologies. In the television video, it can be seen that the NOW TV News cameraman was the first to be pulled down. The camera was seen to make contact with the head of a policeman, who showed an expression of pain. This policeman was holding SCMP photographer Felix Wong. At around 11pm, the tickets for gymnastics, diving, soccer and other popular events had sold out. Certain citizens who had been in the queue for twenty to thirty hours began to rumble and surged forward in spite of police admonishments. The police tried to control the situation. Many Hong Kong media reporters went up to film, and the police tried to stop and oust them. There were physical contact between the two sides. "Why are you hitting me!" "He is shoving me!" Hong Kong reporters yelled. Meanwhile, the police were yelling: "Stop filming, stop filming" and "Go back, go back behind the line!" In the confusion, the NOW TV News cameraman was pulled down from his stool and his camera hit a policeman in the head. This policeman was bleeding in the head and escorted out for treatment. The Cable TV video that its reporter Vicky Law Fai-cheung was gripped in the neck by a police man. Even after Law retreated behind the restricted line, a police officer still went up and shoved him so that he fell on the ground. Law got up and tried to record the badge number of the policeman, but another policeman grabbed his neck from behind. Finally, a police commander ordered a stop to the action. The police officers were using their hands to shield the camera. The Cable TV camera was damaged during the chaos. The Cable TV cameraman was removed from the scene by policemen even as he kept arguing. This reporter yelled out aloud, "Arrest me! Arrest me!" SCMP photographer Felix Wong had a clash with the police and was taken away by two policemen. According to information, Wong was released at 4pm. Xinhua reported that Wong entered the restricted zone to take photos. When the militia police told him to leave, he refused and he used his foot to kick militia police officer Zhang Yuzhu in the groin. The report said that during the investigation, Wong admitted to disobeying the orders of the militia policemen and kicking the militia policeman. According to the preliminary hospital examination, Zhang Yuzhu suffered an injury to his testicles and had to remain in hospital for observation. At 4pm, the SCMP Beijing bureau director and Felix Wong went to the hospital to visit the injured militia policeman Zhang Yuzhu to offer apologies and flowers. SCMP issued a statement to express its regrets. It pointed out that Felix Wong injured the police officer unintentionally. SCMP believes that Wong was only carrying out his duties as a journalist, and that the journalists, the police and the citizens were all victims of the failure by the authorities to organize an orderly ticket sales. Yesterday at around 10am, the Hong Kong reporter named Wong clashed with the police at the Olympic Center. The scene was sheer chaos. The Hong Kong media published the information that the Beijing police had manhandled the media and assaulted Hong Kong reporters. But the police version of the story was different. 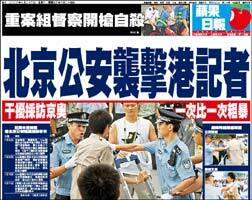 According what SCMP told this newspaper, the police was clashing with the citizens in the queue. SCMP reporter Felix Wong stood on a stool to film the clash. The police stopped Wong from filming, and he lost balance and made accidental contact with a sensitive part of the body of one policeman. The Beijing police narrated a different story. The police leader told this newspaper was that the police had implemented emergency restricts at the Olympic Center ticket sales offices in order to maintain order. Hong Kong reporter Felix Wong entered the emergency restricted zone to take photos. The policemen on duty told him to leave. Wong disobeyed and kicked officer Zhang Yuzhu causing a groin injury. Felix Wong was then taken away by policemen for interrogation. Zhang Yuzhu was taken to the hospital for treatment. The scene showed that Zhang Yuzhu was unable to leave under his own power. Several other policemen held up and put him in a car. Zhang looked pale and pained. Zhang is being held at the hospital for observation. The hospital said that Zhang's testicles were injured. Many other Hong Kong media reporters also had clashes with the police over the restriction of their news gathering activities. According to a Mr. Zhang who was in the queue for tickets, the incident occurred when the chaos was at its height. There was a small disturbance that the police proceeded to stop by designating a restricted zone. The police asked people to move back from that zone. Due to the crowding, some citizens tripped over. Several Hong Kong cameramen went up to film the scene from inside the restricted zone. "The police asked the the reporters to leave the restricted zone, but the reporters did not immediately comply." Mr. Zhang recollected that the media and the police had a war of words first, and both sides used "explosive language." The police kept yelling "No filming" and the media insisted on filming. The police then ousted several Hong Kong reporters from the restricted zone and examined their documents. According to information, a Cable TV reporter was pushed into the ground and claimed to have partial swelling in his throat; a TVB reporter had his camera damaged; a NOW TV reporter was forcibly pulled down from his stool.